Pay attention to our new add-on for CS-Cart 4 "Simple Profit". It adds supplier price in product page in admin panel and calculates the order profit and total profit of a shop. Shipping address – specify supplier's address, city, country, state/province, zipe/postal code. * The Supplier select box is not displayed, if no one supplier was created in your store. If a customer buys a product that is assigned to a supplier, the other shipping methods assigned to this supplier will be available only. If a customer buys several products from different suppliers, several shipping methods (assigned to the suppliers) will be used in the order. The shipping cost will be summed. As long as an order is placed, a notification about it will be sent to the corresponding supplier's email in order that he could ship the purchased product(s) to a customer. 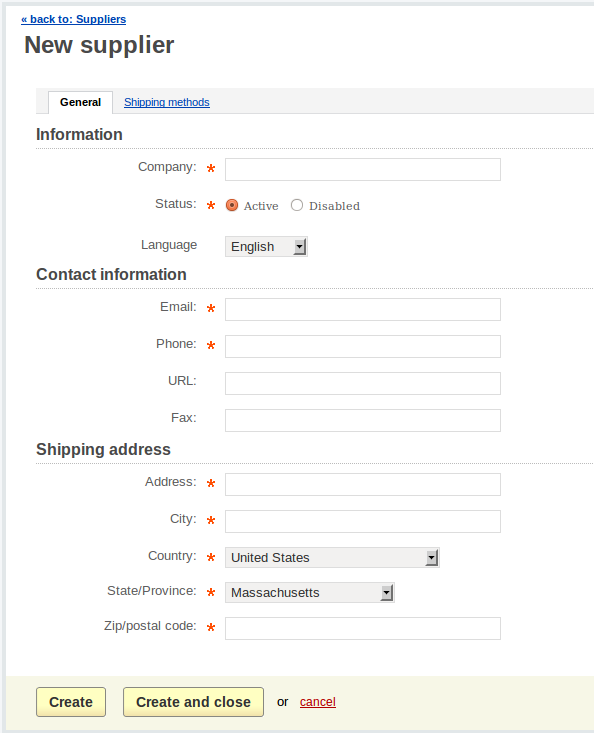 In order to hide the supplier name in the customer area, disable the Display product supplier company setting on the Suppliers functionality settings page. "Infomraiton is power and now I'm a ! @#$ing dictator."